One of the most important creations of the Baroque was the concept of contrast. Renaissance music is typified by its flowing, interweaving lines, most commonly four or five in number, each of them singing (or playing) music that moved at roughly the same pace. Textures of that kind became increasingly rare in the years after 1600. 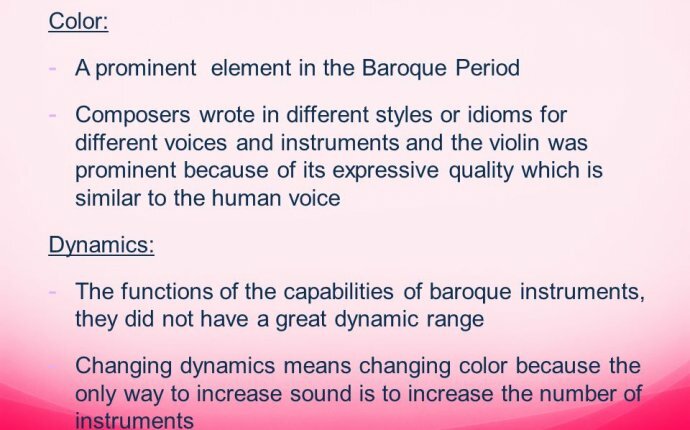 Contrast could exist on various planes: loud and soft; one color and another; solo and tutti; high and low; fast and slow... All these, and others, had their place in the musical schemes of the new Baroque era. I am sure there is dynamic range in the Bach B Minor Mass, and to a degree in Handel's "Messiah". I can't imagine that being delivered in a conservative mezzo forte all the way through including the Hallelujah Chorus. @GoldStarMarimo Well Is that how you would define the Baroque Hole as being?